Update: This guide now includes EVERY single armour set and individual piece of clothing in Breath of the Wild. Clothing has never played a more important role in any Zelda titles than it does in Breath of the Wild. Link's multiple options serve not only to make him more stylish but also to protect him from Hyrule's harsh environment. With that in mind, we've put together a list of all of the options we've been able to find along with what they do for you and how to obtain them. 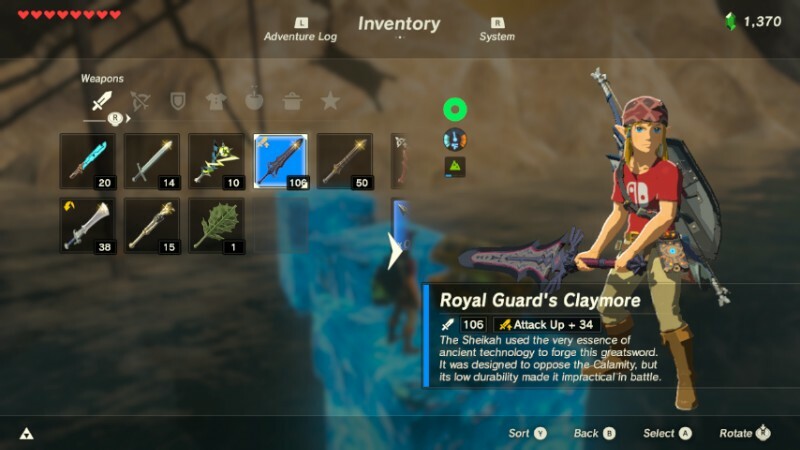 Breath of the Wild is the first Zelda game to offer sets of clothing with unique abilities and set bonuses. For those not versed in RPG terminology, a set bonus is a special skill or boost that is activated when all pieces of a specific armour set are worn simultaneously. In Breath of the Wild, many sets have this type of bonus, but they must first be enhanced at least twice by a Great Fairy (haven't found two Great Fairies yet? No problem, take a look at our Great Fairy guide for help on that front). Helmet: Found in Tu Ka'loh Shrine on Lomei Labyrinth Island near the Akkala Anicent Tech Lab. Chest: Found in Dila Maag Shrine in the South Lomei Labyrinth East of Gerudo Desert. Head: Found in Ree Dahee Shrine, inbetween Dueling Peaks on the road. Chest: Found in Chaas Qeta Shrine, on a small island South of Hateno Ancient Tech Lab. Legs: Found in Tahno O'ah Shrine, Northeast of Hateno Ancient Tech Lab. Head: Complete the sidequest, "Thunder Magnet". Legs: Found in Qukah Nata shrine, near the Southern shore of Calora lake. How to obtain: Purchase in Rito Village clothing shop. How to obtain: Purchase in Hateno Village clothing shop. Helmet: Pull chest out of Lake Toto with Magnesis rune. Legs: Complete Lynel Safari sidequest. You can only obtain the following armour sets using amiibo. We'll detail the exact amiibo you need alongside the set. Helmet: Random drop from 8-Bit Link amiibo chest. Chest: Random drop from 8-Bit Link amiibo chest. Legs: Random drop from 8-Bit Link amiibo chest. Helmet: Random drop from either Toon Link amiibo chest. Chest: Random drop from either Toon Link amiibo chest. Legs: Random drop from either Toon Link amiibo chest. Helmet: Random drop from the Ocarina of Time Link amiibo. Chest: Random drop from the Ocarina of Time Link amiibo. Legs: Random drop from the Ocarina of Time Link amiibo. Helmet: Random drop from either the Super Smash Bros. Link or Twilight Princess Link amiibo chest. Chest: Random drop from either the Super Smash Bros. Link or Twilight Princess Link amiibo chest. Legs: Random drop from either the Super Smash Bros. Link or Twilight Princess Link amiibo chest. Helmet: Random drop from the Skyward Sword Link amiibo chest. Chest: Random drop from the Skyward Sword Link amiibo chest. Legs: Random drop from the Skyward Sword Link amiibo chest. Helmet: Random drop from the Majora's Mask Link amiibo chest. Chest: Random drop from the Majora's Mask Link amiibo chest. Legs: Random drop from the Majora's Mask Link amiibo chest. The following armour sets can only be obtained by purchasing DLC. We'll aim to detail both the DLC you need to purchase, and what you need to do to get the set. How to obtain: You have to first beat the DLC side quest 'EX Treasure: Fairy Clothes'. Helmet: In a partially buried chest in Exchange Ruins. Chest: In a partially buried chest in Castle Town Ruins. Legs: In a partially buried chest in Mabe Village Ruins. How to obtain: You'll find these pieces during the quest EX Treasure: Phatasma. Helmet: In a partially buried chest in Coliseum Ruins. Chest: In a partially buried chest in Sacred Ground Ruins. Legs: In a partially buried chest in Hyrule Garrison Ruins. How to obtain: This set is found as part of the quest 'Xenoblade Chronicles 2'. Helmet: Look for a red shooting star on the Bridge of Hylia at night. Head to the location it lands at to find this armour piece inside a chest. Chest: Look for a red shooting star at Skull Lake at night. Head to the location it lands at to find this armour piece inside a chest. Legs: Look for a red shooting star at the top of Hebra Peak at night. Head to the location it lands at to find this armour piece inside a chest. How to obtain: Found as part of the quest 'EX Treasure: Dark Armor'. Helmet: Found in a chest beneath a waterfall leading to Corta Lake. Chest: Found in a chest beneath Sarjon Bridge. Legs: Found in a chest next to the broken statue in Ebara Forest. How to obtain: Found as part of the quest 'EX Royal Guard Rumors'. Helmet: Found in a chest in the Dining Hall of Hyrule Castle. Chest: Found in a chest in the Guards' Chamber in Hyrule Castle. Legs: Found in a chest in the second floor of the Sanctum in Hyrule Castle. Not all of Link's vestments are part of a matched set, and not all sets have bonuses. By and large, the single pieces have bonuses of their own that rival those of the sets, and best of all you can have the effects of them without relying on other equipment, giving you even more options. Create the recipe described in a journal for a dish the Old Man has forgotten in the Great Plateau. Climb to the top of Mount Hylia and the Old Man will appear to give you it. Found in the Old Man's hut after completing the Great Plateau. Purchase from Hateno Village armour shop. How to obtain: Purchase from the jeweler in Gerudo Town. How to obtain: Recover the first of Link's memories. How to obtain: Find in a chest under Tu'Kaloh Shrine in Lomei Labyrinth. How to obtain: Purchase at Kilton's Monster Shop. How to obtain: Purchase from Kilton's Monster Shop. How to obtain: Complete the sidequest, "The Eighth Heroine". How to obtain: Complete the sidequest, "The Forgotten Sword". How to obtain: Complete the "The Thunder Helm" side quest. The following single item outfit pieces can only be obtained using amiibo. We'll list the exact amiibo you'll need to obtain each item. How to obtain: Random drop from the Sheik amiibo chest. How to obtain: Obtained using the Zora Champion Mipha amiibo chest. How to obtain: Obtained using the Gerudo Champion Urbosa amiibo chest. How to obtain: Obtained using the Rito Champion Revali amiibo chest. How to obtain: Obtained using the Goron Champion Daruk amiibo chest. The following single outfit items can only be obtained by purchasing DLC. We'll list the exact DLC you'll need and what you have to do to get each piece. How to obtain: In a chest on a wall next to the Ja Baij Shrine on the Great Plateau. How to obtain: This piece is found as part of the quest 'EX Strange Mask Rumors'. You'll find it in a chest inside a hollow tree in the Lost Woods. How to obtain: This piece is found as part of the quest 'EX Treasure: Twilight Relic'. You'll find it in a partially buried chest in Sage Temple Ruins. How to obtain: This piece is found as pat of the quest 'EX Treasure: Ancient Mask'. You'll find it in a partially buried chest in Garrison Ruins. How to obtain: Obtained as part of the side quest EX Treasure: Merchant's Hood. Found in a partially buried chest near the Spring of Courage. How to obtain: Obtained as part of the side quest EX Treasure: Usurper King. You'll find it in a chest in Tobio's Hollow. How to obtain: Obtained as part of the side quest EX Treasure: Garb of the Winds. You'll find it in a chest at Cora Lake. 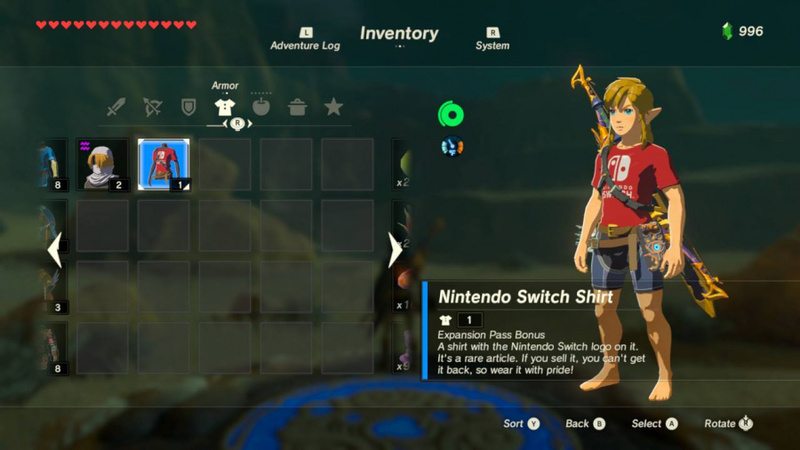 So, there you have it - a complete list of all the clothing you can currently obtain in Breath of the Wild. Which of Link's new duds are your favorites? Have you dyed them? Do you prefer special weapons with certain outfits? Show us how your Link looks in the comments below! I gotta stop looking at these. Part of what makes this game so enjoyable is discovering this sort of thing on your own without the linear restraints. From the looks of it most of the items are bought? That's cool. But it does mean I will need to go on a money farming spree eventually. It would take hours to even come close to the cost. I thought the Snowquill armor makes you very resistant to cold, and the set bonus makes you totally impervious. I admit I usually like to learn on my own, but I'm getting nothing accomplished in this game. I have literally found 9 shrines. I have found the zora. Mostly I wander around fighting monsters and collections material. I have like 1400 rupees from selling monster material but haven't really found armor to buy except the Julian set. Side note, on my monster hunts I have killed 3 hiko. The first one, I stumbled on, I still had original clothes, 3 hearts, and no arrows. I ran around throwing bombs, knocking trees over to hit this giant. It took literally 25 minutes, but I killed him when I had no right to do so. And I jumped up both doing my victory dance and crowing like a drunken fool. Those are the moment that make me love this game. Lady Gaga costume DLC ? "Clothing has never played a more important role in any Zelda titles than it does in Breath of the Wild." Tri Force Heroes says hello. Nice guide, can't wait until you guys cover the amiibo guide. Was able to get Sheik’s Mask from scanning Sheik, not on the first try though. Was a interesting surprise. Don't want to appear stupid but how do I save this article to view later? Could you guys add the defense rating for the armor? I know I shouldn't be looking at these types of things, but I can't help myself. I want the best! The barbarian helmet shall be mine! Thanks. I know where I'm heading first thing after work. I'll find the rest on my own. As far as usefulness goes, the stealth armor set is definitely my favorite and the one I wear the most. It's nice being able to so easily avoid enemies and walk right up to them to take their picture for the compendium. As far as what I think will look the best, it'll probably be one of the Amiibo sets. How do you get the Switch shirt? You guys neglected to list the Warm Doublet! You can buy it in a town (can't remember if it's Kakariko or Hateno) or get it on the starting plateau by making a certain dish for the old tutorial man. @VR32F1END That one's from a DLC chest. All three DLC chests are on the starter plateau, I believe. You get them right away? I bought the pass last night but I thought it was gonna be awhile before it impacted the game. @VR32F1END Yeah, as soon as you buy the DLC they appear, but the locations are a bit obscure. A quick google search should find a youtube video or two showing where on the plateau to find them. You get 3 chests, and one has the Switch shirt. I found them now... very disappointing. Thanks for the heads up though! The Ancient Armour Set bothers me, because it protects you against the very enemies you need to grind to get it in the first place. By the time you get it, you probably don't need it. @nab1 You can get most of the stuff you need without ever killing a guardian. The cores are mostly found in shrines anyway. The fields around Hateno and Akkala (watch out for live ones here) have plenty of gears. I recommend getting the pants first, as the Champions tunic identifies live guardian turrets hiding in wait and also has more armor than any pants, and the Diamond circlet is really easy to get. @Grandpa_Pixel Actually, the ones I bought so far weren't that expensive. You can easily get 1500 rupees together by selling lots of monster parts (those that go for 20-25 rupees) or gems like Luminous Stone, for example. First the amiibo article and now this. Did Nintendo announce "Zelda BotW: Complete Edition" for Christmas and you guys forgot to run that article first and these 2 just "leaked out" out of order and ahead of schedule? 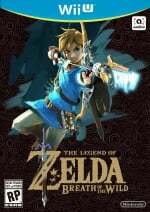 Sheikah set isn't listed? Its sooo good. Increased stealth, and set bonus is speed boost at night. Best set IMO for players who like to play sneaky. @Rumncoke25 I remember when I killed my first Flying Redialathan in the game. Took like 20 tries, but when I got it I danced too. Good times. @hirokun It is the best for hunting for sure or if you want to take an enemy base without much of a fight. The added bonus isn't really usefult to me since I usually have food with 3 tiers speed for 30 minutes. @Flowerlark Or use the sheikah slate to look for treasure chests. You'll eventually find them. @Flowerlark The lists covers the "best" Clothing and Armor. The doublet can't be upgraded and it is outclassed by the Snowquill set. 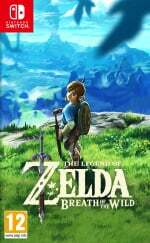 @VR32X It is, but you can get 3 chests in the Great Plateau from the get go. Use your Sheikah Slate to locate the treasure chests (they are different from any other chest in the game). Some other goodies are unlocked too, but others you'll have to meet some requirements in game to gain access to them. @Zelink Bookmark it in your browser. If you use a feed reader, you can save it there too. If this doesn't work, you can copy the link and save it in your email client as draft or send it to you. If you don't like any of this, you can always write down the link in a note and put it in your pocket. If this is just so much of an inconvenience, you can try to memorize it. @dsparil Well, something like that. You can't freeze. If you touch an ice keese it will not freeze you, the same if you get hit with ice arrows, or if you stand in an ice talos, etc. etc. @Devlind um... you do know you just responded to a bunch of comments from over a year ago, right? Just to clarify, I went through a cleaning spree in my feed reader and I found this and a couple more of articles from NLife. Thought it would be fun to comment on them for the sake of it. @Devlind fair enough, just was checking. @ShadJV I'm not stalking this article, I swear! The Sheikah stealth armor is my favorite. Together with the Snowquill Armour set it's the most stylish and useful. I don't have this on Switch yet, but one of the last few pictures that I took of this game on my Wii U - through Miiverse - had my Link looking like this while holding what was my favorite sword until I broke it on Ganon's big head lol. Amber Earrings increase defense, not give heat resistance.